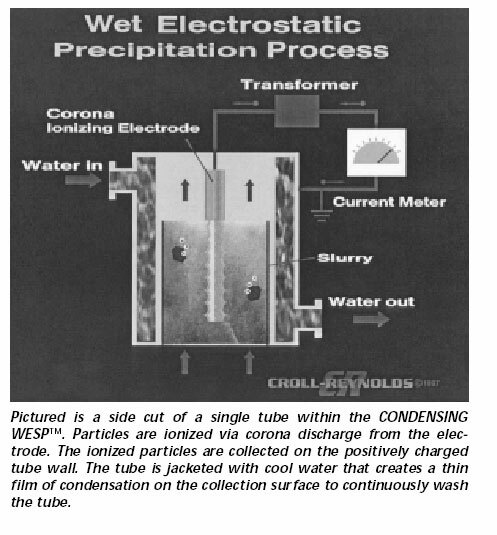 Croll-Reynolds' patented CONDENSING WESPTM is a tubular, up-flow wet electrostatic precipitator that uses water film created by condensation to clean the collecting electrode surface. Appropriate for continuous applications that demand online washing and reliability. By cooling the outside wall of the round collection tube with liquid, the saturated gas stream temperature decreases and condenses moisture from the gas. The condensed moisture thoroughly covers the entire collecting electrode surface creating a constant film of liquid to wash the collection surface. This prevents dry zones from forming and particulate building up on the collection surface, allowing for maximum performance with minimum offline washing and maintenance. Croll-Reynolds Clean Air Technologies/Croll-Reynolds Company, Inc., 751 Central Avenue, Westfield, NJ 07091-0668. Tel: 908-232-4200; Fax: 908-232-2146.